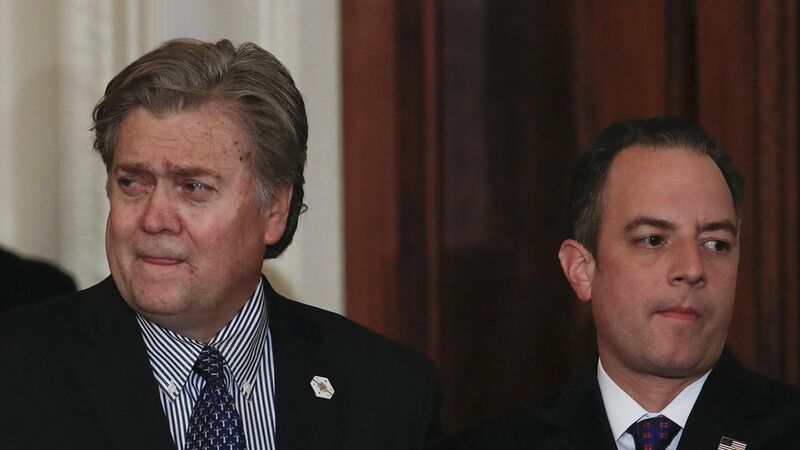 President Trump is considering a broad shakeup of his White House that could include the replacement of White House Chief of Staff Reince Priebus and the departure of chief strategist Steve Bannon, aides and advisers tell us. A top aide to Trump said he's contemplating major changes, but that the situation is very fluid and the timing uncertain: "Things are happening, but it's very unclear the president's willing to pull that trigger." House Majority Leader Kevin McCarthy (R-Calif.), who developed a bond with Trump as one of the earlier congressional leaders to support him, and remains a confidant. Wayne Berman of Blackstone Group, a Washington heavy-hitter who was an Assistant Secretary of Commerce under President George H.W. Bush, and a key adviser on eight presidential campaigns. David Urban of the Washington advisory firm American Continental Group, and a former chief of staff to the late Sen. Arlen Specter (R-Pa.). Urban helped Trump win an upset victory in Pennsylvania, and was in constant cellphone contact with the candidate throughout the campaign. Gary Cohn, Trump's economic adviser and the former #2 at Goldman Sachs, who has built a formidable team and internal clout. The West Wing "Game of Thrones" has been raging ever since Trump took office. But the war between the nationalists and the moderates, led by Jared Kushner and Ivanka Trump, burst into the open this week after Bannon was taken off the National Security Council, setting off a torrent of leaks against him. Bannon called reports that he was ready to quit "100 percent nonsense." Axios' Jonathan Swan reports that Bannon told associates: "I love a gunfight." The top aide — along with many other Trump officials, advisers and friends — told us that it seems to be more a question of "when" not "whether" change will come: "The tension, the exhaustion, the raw nerves have gotten much harder to disguise."